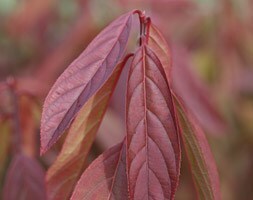 Position: full sun Soil: fertile, humus-rich, well-drained, neutral to alkaline soil Rate of Growth: average Flowering period: April and May, then intermittently until October Hardiness: fully hardy This easy to grow shrub will flower for months, so it is perfect for smaller gardens where you need high-performance plants. 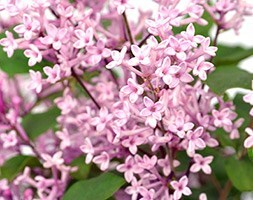 Like other lilacs, it has an initial (main) flush of flowers in mid- to late spring, but then it will carry on flowering intermittently right through to mid-autumn. It is relatively compact so can be grown in a large patio pot if kept well fed and watered, and will make a rewarding addition to the shrub or mixed border. Garden care: In mid summer remove the faded flower heads carefully using secateurs to avoid damaging the young shoots. Apply a generous 5-7cm (2-3in) mulch of well-rotted garden compost or manure around the base of the plant in early spring. Position: full sun or partial shade Soil: prefers moist, well-drained, acidic soil or ericaceous compost in a pot. Rate of growth: average Other features: great in pots Hardiness: fully hardy Garden care: Prepare the ground well before planting. Prune in winter, cutting out dead or damaged branches. In spring, feed with sulphate of ammonia, sulphate of potash and bonemeal and top-dress with ericaceous compost. 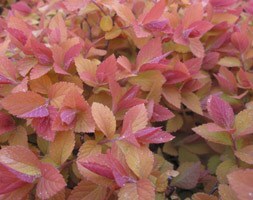 Position: full sun Soil: fertile, moist, well-drained soil Rate of Growth: average to fast Flowering period: April and May Hardiness: fully hardy This colourful deciduous shrub creates interest from early spring, when the foliage emerges a rich orange shade. It soon turns golden yellow, but is then accompanied by larger than average (in fact the largest we have ever seen) flat-topped clusters of pink blooms. 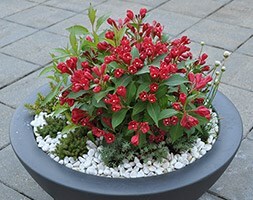 It is relatively compact, so can easily be squeezed into the shrub border or large patio pot. Garden care: Immediately after flowering prune flowered shoots to strong buds. On mature specimens cut back between a quarter to a fifth of the old shoots to the base. 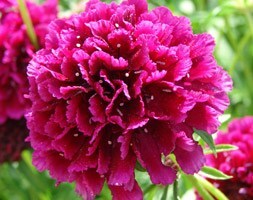 Position: full sun or partial shade Soil: fertile, well-drained soil Rate of growth: fast Flowering period: April to October Flower colour: dark red Hardiness: fully hardy Very long flowering period from April to October. Garden care: Once established prune each year in midsummer after flowering, removing one or two of the older stems to the base and cutting back the flowered stems to strong shoots below the spent flowers. 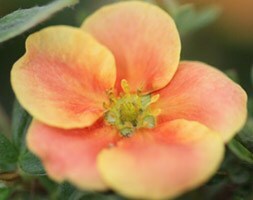 Position: full sun to partial shade Soil: poor to moderately fertile, well-drained soil Rate of growth: average Flowering period: June to October Hardiness: fully hardy A new potentilla that will often flower non-stop from early summer to mid-autumn. The flowers are a rich sunset orange shade, and they resolutely keep this hue, resisting the urge to fade in full sun. Perfect for the front row of a mixed or shrub border, they will mix splendidly with other hot tones, as well as rich purples and chartreuse green. Garden care: Trim lightly after flowering, cutting the older stems to the base and removing weak, spindly growth. Apply a generous 5-7cm (2-3in) mulch of well-rotted compost or manure around the base of the plant in spring. Position: full sun Soil: humus-rich, moist but well-drained, neutral to slightly alkaline soil Rate of growth: average to fast-growing Flowering period: August to October Hardiness: fully hardy Large, double, blue flowers with a neat swirl of smaller petals in the centre appear from August to October. 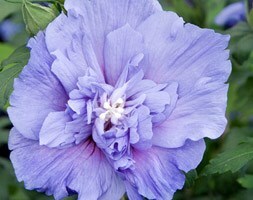 This is an award winning tree hollyhock that makes an excellent specimen plant for a sheltered, sunny border. Unlike some of the older, double varieties it stands up particularly well to wind and rain. 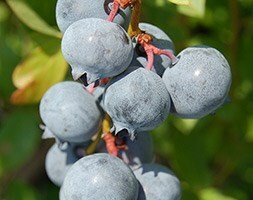 Garden care: To encourage a bushy habit prune young plants hard in late spring. After pruning apply a generous 5-7cm mulch of well-rotted garden compost or manure around the base of the plant. Once established it requires little if any regular pruning. Position: partial shade Soil: fertile, reliably moist , slightly acidic soil Rate of growth: average Flowering period: July to September Hardiness: frost hardy (may need protection in winter) Noted for its slender somewhat pendent spires of fragrant, greenish white flowers, which form on the arching branches throughout summer, this shade-tolerant deciduous shrub also puts on a good displaty in autumn when the lustrous green leaves turn a rich shade of burgundy before they drop. A great addition to the woodland garden or shadier sections of the shrub border, it flourishes where there is reliable moisture, so can alsdo be sited near a pond or stream. Garden care: Protect from cold, drying winds and apply a generous layer of mulch around young plants in autumn. Trim back to tidy in the spring and provide support for wall-trained plants. Position: full sun Soil:moderately fertile, well-drained, neutral to slightly alkaline soil Rate of growth: average Flowering period: July and August Hardiness: fully hardy Somewhat ruffled raspberry coloured florets with prominent white stamens, look wonderful in a sunny border when intermingled with blue or purple flowering perennials. They also look very effective when highlighted by a screen of silver foliage. Garden care: Protect young plants from slug damage using environmentally friendly slug pellets or beer traps. Deadhead regularly to prolong flowering and cut back the faded flower stems in autumn. Lift and divide large clumps every three years in spring. 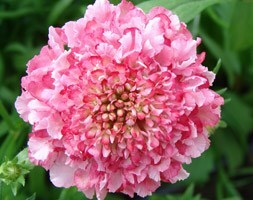 Position: full sun Soil:moderately fertile, well-drained, neutral to slightly alkaline soil Rate of growth: average Flowering period: July and August Hardiness: fully hardy Ideal for gravel gardens or patio pots, this pink-flowering perennial becomes tolerant of drought once established. Naturally prolific, prompt deadheading will encourage even more flowerheads to form, often prolonging the season into early autumn. Garden care: Protect young plants from slug damage using environmentally friendly slug pellets or beer traps. Deadhead regularly to prolong flowering and cut back the faded flower stems in autumn. Lift and divide large clumps every three years in spring.